Chess is some kind of 'brain' game type which can played by children, adolescent and adult. Chess game need to thinking hard in decided the strategies to win. Basically, chess is simple game which has main purpose that is protect the King well. The game overed by King's dead or caught by the opponents side. Each pieces have different move direction, so the player should has good strategies to win the game. Children also like to play chess game. They often like to play it at garden, backyard, beach, public park and other outdoor area. The suit chess pieces for outdoor area are the big one. The outdoor chess game will more interesting to use the unique chess pieces that designed in bigger than standard chess pieces. All rule never change, the different is how the player play it. 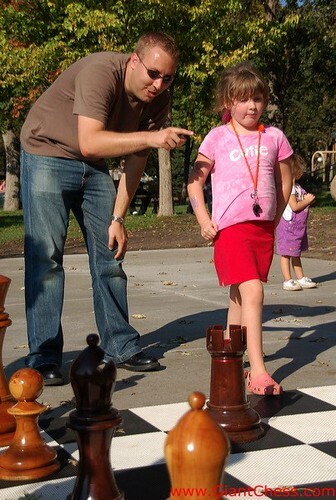 Outdoor chess game will give unforgetable game for you, children and people. Try it!